"I am so impressed with the way that DeskManager interfaces with QuickBooks so beautifully, even letting me click on a transaction in DeskManager and having it open the transaction in QuickBooks for me. I just wanted to let you know how thankful I am that you kept bugging me about trying your software, because it has become an amazing tool and will save me tons of time and frustration!" "Like many dealers, we were using Tracker for many years. When Tracker closed and support stopped, I was devastated! AutoManager stepped in and had my Tracker files converted to DeskManager in no time. We were up and running, more efficiently than ever." "AutoManager has worked closely with us to ensure accuracy with our copyrighted Ren’T’Own® and Lease’T’Own® contracts and forms. Their programmers step up quickly whenever we run into a problem or unique situation. Most importantly, we have received numerous positive comments from our Ren’T’Own® and Lease’T’Own® dealers who use DeskManager." "[DeskManager is] probably one of the most comprehensive DMS tools available to small or non-franchised dealers. We really like the [QuickBooks Direct Interface] accounting aspect." 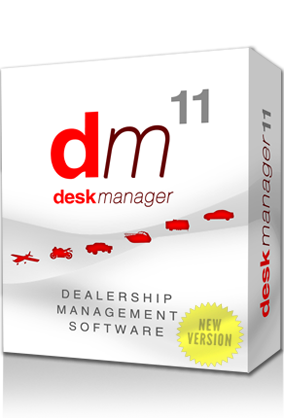 "DeskManager has more power for the price than any other DMS we tested. Every time we’ve had an issue or needed a form, they’ve stuck with us until everything was completely resolved. You don’t usually see that with inexpensive dealer management systems." "My salespeople love the prospect aspect [of DeskManager]. When a prospect turns into a sale, all they have to do is click a button so they get all the customer information without having to copy it over again. It’s a huge time saver." "We tried many other programs, but in the end we chose DeskManager because the real power of DeskManager is not the software alone, but the after-sale support and flexibility in solving our business requirements." Bob's Irresistable Auto Sales, Inc.
"I just started a new RV and auto sales business last year. We’ve had the challenge of dealing with explosive growth right out of the gate, and the guys at AutoManager have been with me every step of the way. Deskmanager and Webmanager are super easy to use and have allowed me to focus on my customers rather than get bogged down with managing inventory and marketing efforts. From sales to tech support, I always get excellent advice. The whole package is fast, easy to use, and comprehensive." Highway RV and Auto, Inc.
"Personally, I just like how [DeskManager] operates. It’s very straightforward and well-organized. I did a lot of research with other companies, and I just couldn’t walk away from the opportunity DeskManager gave us with the ability to integrate our DMS with our website."